This workshop was for independent artists, choreographers, and dance groups with budgets below $200,000 and was facilitated by Fractured Atlas, a nonprofit technology company that helps artists with the business side of their practice, in collaboration with Dance/USA. This two-part workshop took place on Friday, June 10, 2016 at the Dance/USA 2016 Annual Conference in Austin, TX and was FREE to all. Jump start your creative practice with this hands-on co-learning experience on building, leading, and managing a small dance business. All dance makers are welcome in this space regardless of your incorporation status (for-profit, nonprofit, fiscally sponsored, individual, etc.). Whether you're an established independent artist, you've just started a company, or you're somewhere in between, managing the intricacies of both the business and creative side of a dance business is challenging. Join other entrepreneurial dance makers for this special session where you'll learn ways to tackle core challenges like fundraising (individuals, grants, and crowdfunding), building an audience, finding and choosing your team, strategic decision making, and more. The main portion of the workshop is spending time in a structured co-learning environment with your peers tackling common administrative challenges. There will be a break between 11:30am and 1:30pm where you can check out local dining options nearby. We encourage you to attend both sessions of the Bootcamp to get the most meaningful experience. Fractured Atlas is a nonprofit technology company that serves artists. They help artists raise money, manage risk, find space, sell tickets, track their fans, and advocate as a field. Fractured Atlas is the largest member-based arts organization in the nation with over 54,000 members nationwide in all artistic disciplines- helping artists raise nearly $20 million annually for their creative projects. They empower artists, arts organizations, and other cultural sector stakeholders by eliminating practical barriers to artistic expression, so as to foster a more agile and resilient cultural ecosystem. The 2016 Dance Business Bootcamp was FREE to all and required registration. Those already registered for the full Annual Conference or a day pass for Friday, June 10, were eligible to attend the Bootcamp at no additional cost to your registration fee. If people were only attending the Dance Business Bootcamp, they were permitted to only attend Bootcamp related activities. 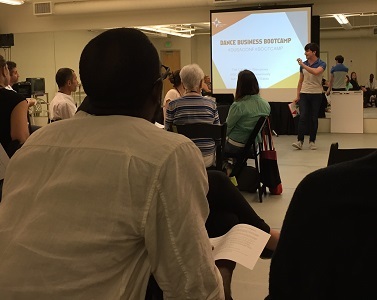 Support for the 2016 Dance Business Bootcamp was generously provided by the City of Austin's Economic Development Department.